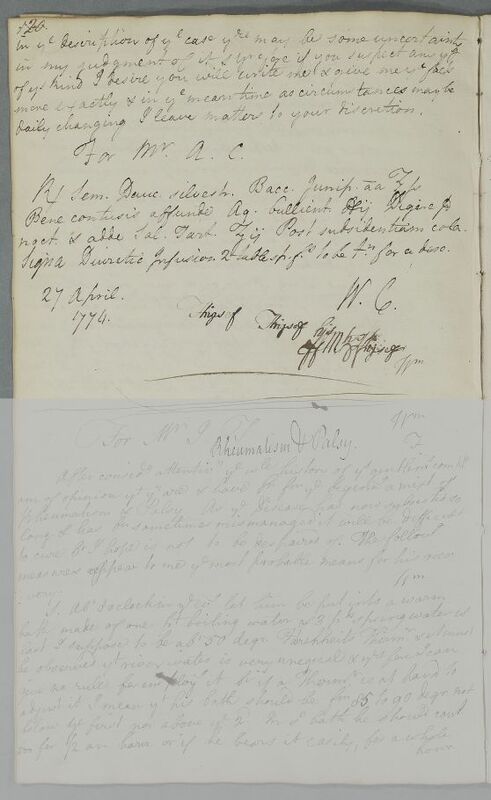 Reply to Mr Thomas Duncanson, Surgeon at Forres, on treatment of his friend or relative, Mr. A. C., who has a variety of symptoms. Cullen concentrates on his abdominal swelling and evening fever. A diuretic prescription follows. Below the prescription, there are some random marks suggesting the testing of a quill-pen (not transcribed). 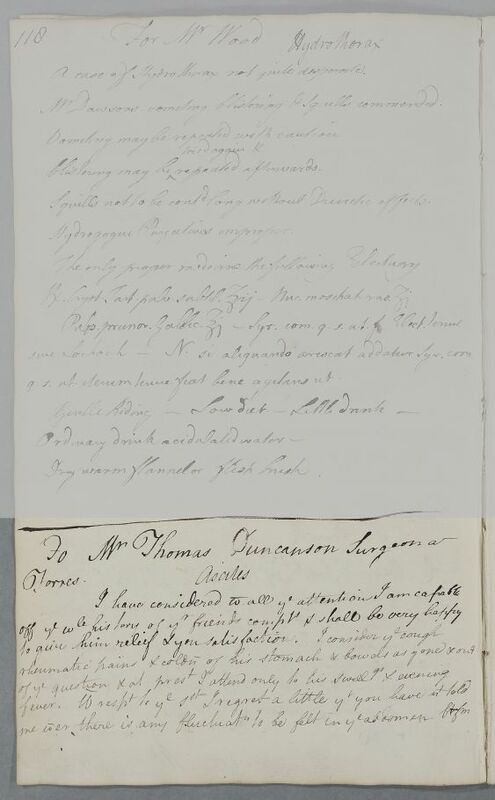 Summary Reply to Mr Thomas Duncanson, Surgeon at Forres, on treatment of his friend or relative, Mr. A. C., who has a variety of symptoms. Cullen concentrates on his abdominal swelling and evening fever. A diuretic prescription follows. Below the prescription, there are some random marks suggesting the testing of a quill-pen (not transcribed). Case of Mr. A. C., who has a variety of symptoms. including abdominal swelling and evening fever. have it repeated every 2 or 3 day as his strength may bear. In the intermediate days let him take a dose of crem. Tart. not bear any strong Hydragogue. him but he must as much as possible avoid broth & all liquid food. [considerable?] let it be anointed all over with Olive oil. of 8 or 10 days the trouble of it may be afterwards saved. daily changing I leave matters to your discretion. Take half an ounce each of Wild Carrot seeds and Juniper. Crush well and pour over two pints of boiling water. Steep overnight and add two drachms of Salts of Tartar. After it has settled, strain. Label: Diuretic Infusion, 2 tablespoonfuls to be taken for a dose. 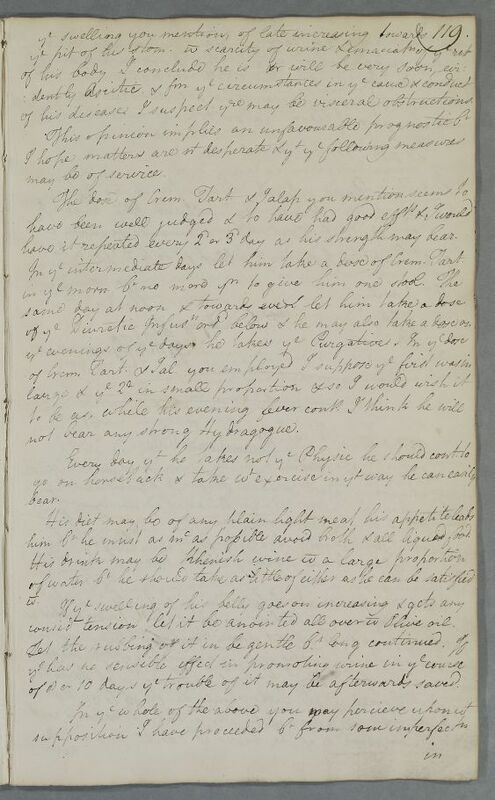 1: The marks to be seen on the page at this point are probably just the result of testing of a new quill (pen). In ye intermediate days let him take a dose of crem. Tart. him bt he must as mc as possible avoid broth & all liquid food. [consider?] let it be anointed all over w Olive oil. of 8 or 10 days ye trouble of it may be afterwards saved. Signa Diuretic Infusion 2 tablesp. f.s to be t.n for a dose.